Line a 13x9x2-inch baking pan with foil and place the pork in the pan. In a small bowl, combine the chili powder, salt, and cayenne. Rub the mixture over all sides of the meat, pressing it to adhere (if the meat is tied together with twine or netting, just rub the seasoning right over it). Set aside. In a large skillet over medium-high heat, warm the oil. 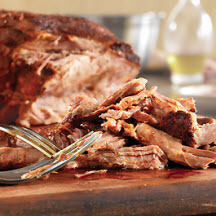 Add the pork and brown on all sides, 6 to 8 minutes Transfer the meat to a slow cooker. Nutritional Information Per Serving (1/8 of recipe): Calories: 240; Total Fat: 11g; Saturated Fat: 3g; Cholesterol: 90mg; Total Carbs: 1g; Fiber: 0g; Protein: 32g; Sodium: 540mg.